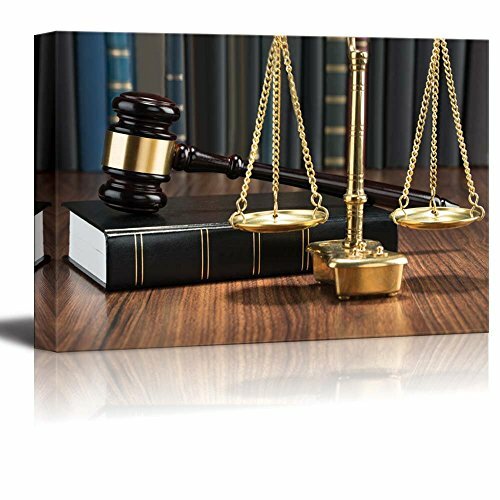 Canvas Prints Wall Art - Wooden Gavel on Book with Golden Scale on Table Justice Concept | Lawyer Office Decor Stretched Gallery Canvas Wrap Giclee Print & Ready to Hang - 16" x 24"
The canvas looked very nice. Was a gift and he loved it. My grandson wanted this for his bedroom in their new house. My daughter wants to buy one for their law office. Oh, my grandson is 12. Looks GREAT in my office! Great print. Only complaint was it had a tiny scratch across the front close to the corner. Was able to cover up with a sharpie. Otherwise, arrived very quickly and great picture. Large size, good quality picture. Will not find this size canvas at the price. Highly recommend. Product exactly as pictured and packaged securely. It made a great gift for my brother-in-law, who was appointed as a judge. Hung on the wall in the Judges' chamber....looks great! Looks better than I expected. It hangs in my law office conference room and had many compliments.